This day trip operates April to October, available every Tuesday. East of London lies the county of Kent, known as the Garden of England. We will tour the leafy lanes and winding roads, following the pilgrim's route to the great cathedral at Canterbury, admire Leeds Castle, the 'loveliest in the world' and stand high up on the dramatic White Cliffs of Dover and look outwards across the channel to France. 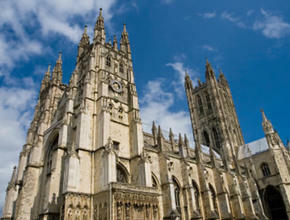 We travel over the Weald of Kent, past hop fields, orchards and Oast Houses to the city of Canterbury for a guided tour within its ancient walls and entry included to Canterbury Cathedral. Once in the cathedral, the cradle of English Christianity, we hear of St Augustine and the baptism of King Ethelbert in the year 597 and the brutal murder of St Thomas Becket in 1170. Within the precincts and cloisters of this great cathedral lie the tombs of many Archbishops, Edward the Black Prince and King Henry IV. A wealth of architecture is revealed around every corner, from the Norman columns in the crypt to the illuminating arches of the Early English nave. Elsewhere in the city there will be time to explore the castle, the historic Westgate and the streets of timber-framed houses with their distinctive hanging tiles. We depart Canterbury and drive to the historic port of Dover. On arrival on Dover there is a photo stop at Dover Castle, a fortress and known as the key to England. From here we drive along the White Cliffs of Dover until we arrive at the Battle of Britain Memorial at Capel-le-Ferne. 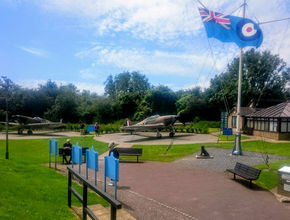 Here we can look out over the ocean to France, have a view of the famous White Cliffs of Dover, and recall a less peaceful time when the skies above Kent were witness to outstanding acts of bravery as less than 3,000 men tried to change the course of World War II and stop the Nazis from gaining air superiority and invading this country. Learn of pilots, planes, heroic acts, dogfights, casualties, let your mind absorb all this around you and remember those words of Winston Churchill - "Never in the field of human conflict was so much owed by so many to so few". 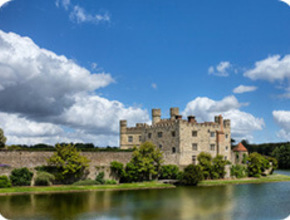 Finally we proceed to Leeds Castle, set majestically within an island on a natural lake. The residence of many English Queens over several centuries, this popular home was described by Lord Conway as 'the loveliest castle in the world'. After a guided tour through the gardens there will be plenty of free time to explore the castle and maze before our return to London. If you intend to travel to our central London meeting points by public transport, you can plan your journey in advance on the Transport for London website.